It's almost impossible for anyone to not know about the mystical and romantic story of the Beauty and the Beast. A tale of how love can blossom between the unlikeliest of couples have made both young children and young adults. If you can relate, maybe it's best to try these online slots now! If you want to see how love can blossom between you and your favourite mobile device, all the while you gain a high amount of winnings at the same time, then you should take an hour out of your day to play Yggdrasil's Beauty And The Beast! Experience what's like to be 10 years old and watch the Disney Classic again, all the while you fill your pockets with the number of cash prizes you will obtain. 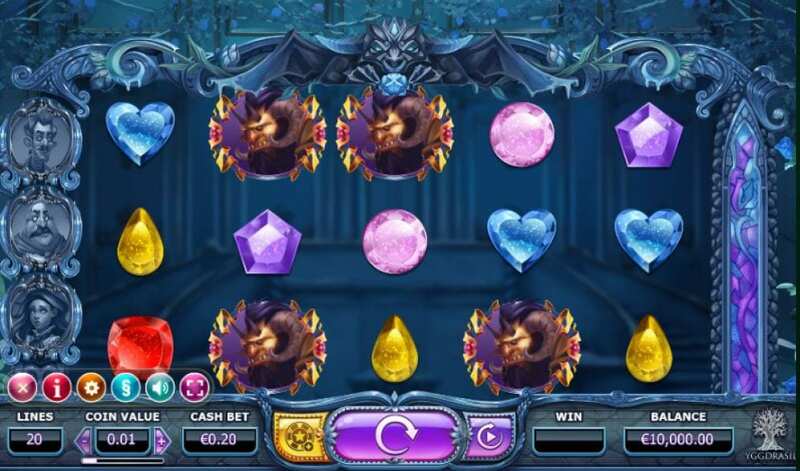 Naming themselves after the great Scandinavian mythology of the 'Huge Ash Tree', Yggdrasil gave themselves a mission to make every one of their iGaming products more advanced, and more entertaining than the last. After leaving NetEnt, the CEO decided to create a new brand based in Malta that merges cinematic elements to gameplay. So that casino gamers can feel like they're actually a part of the game rather than just playing it. And if you're a bit sceptical on the thought of getting excited and loaded over a game like Beauty And The Beast, then you should have a look at the great reviews that previous players have written about Winterberries, Vikings Go Berzerk, and Empire Fortune! 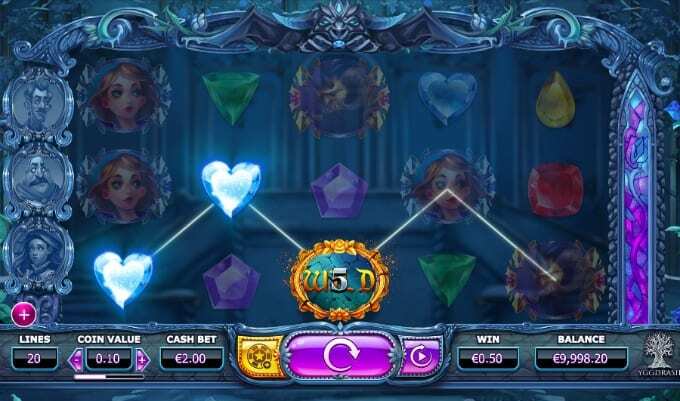 You can fond out more about the range of games that Yggdrasil Gaming offer here on Wizards Slots online casino. Like with most of Yggdrasil's games, you'll see a short intro play on your screen, where it's raining viciously outside, go up the steps of a stone mansion, and get introduced by a ghostly butler along with the game titles. We can help you with picking the best slots for you when you read more from our guide! The reels are fixed on a 5x3 grid, with 20 paylines, and a massive granitic hallway blurred in the background. For those wondering what the base symbols are, you have a collection of gems that give you the low payouts, and the main characters of the game that give you the high payouts. And like with most slot games, you need a matching combination of 3, 4, or 5, identical icons to make a win. But it's not just the base symbols that you have to watch out for in this game, as there are many special icons that can help you achieve what it is that you desire most. WILD logo: Substitutes all of the base symbols except for the Free Spins symbols and the SCATTERS. Free Spin Symbol: If you get 3, 4, or 5 of these icons on the reel in a match, you trigger either10 free spins, 10 free spins and 1000 coins, or 10 free spins and 5000 coins. Butler SCATTER: On the base game, this symbol can appear on any reel and nudge it either up or down to give you the best possible outcome. He also appears on the free spin. Chef SCATTER: On the base game, this symbol matches the 2nd, 3rd, and 4th reel with matching icons. He also appears on the free spin. Maid SCATTER: On the base game, this symbol places 2, 3, or 4 WILD symbols on any given position on the reels, she also appears on the free spin. Golden Bet BONUS FEATURE: You can activate this feature at any time during the base game. It gives you extra features that can help you boost your winnings instantly but at a cost of up to 30 coins for each feature. It's no surprise that so many children are captivated by the story of a young girl taken in by a monstrous beast, and ended up growing a feeling so strong it can overcome anything. Furthermore, it's no surprise that so many online casino players are captivated by this game that makes them remember the feeling and gain big winnings after collecting as many matching combinations on the reels.